I’ve received a few emails from people curious to know more about the greenhouse. 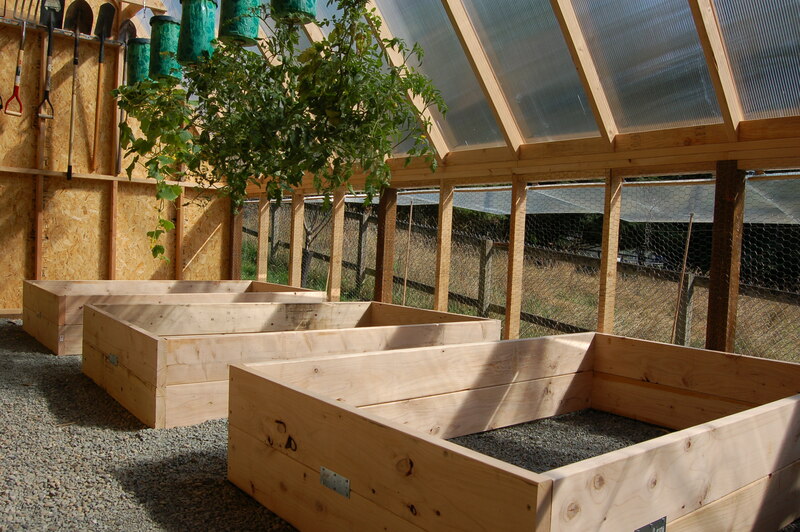 When I started researching greenhouse options, I primarily looked at kits. 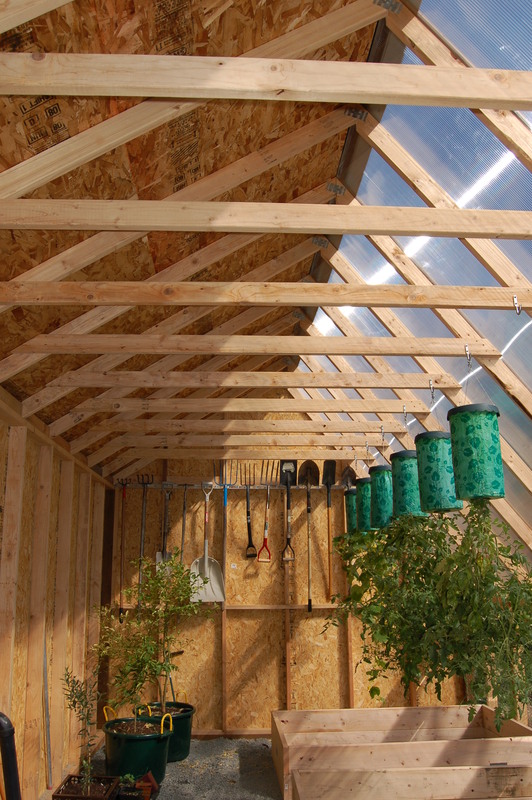 There are numerous online and catalogue retailers that sell all shapes and sizes of greenhouses. I had an idea, however, for a structure that would be multi-purpose and I didn’t see any kits that were what I was looking for. After doing some research, I found a plan for a passive solar greenhouseon the University of Missouri site. The plan I saw there was very similar to a concept I had sketched out, plus the objective of the project was to make it low-energy using. Intrigued, I called a local shed building company and was referred to Don Leikness, who ended up building the greenhouse for us. Don did a great job and I enthusiastically recommend him (he can be reached at bleikness@aol.com). One of the things I like best about the greenhouse is that the sides open up. This allows for great ventilation on the hottest days. It’s hard to see, but we covered the openings with chicken wire. We originally did this to use the greenhouse as a temporary chicken coop, but we decided that the wire is a good idea because it will keep bunnies out. You can also see in the photo to the right that we have a number of hanging planters. One advantage of the tall height of the structure is that it gives us plenty of space to hang plants. Since our summer stalled out and the weather has been cool, I moved all our hanging planters into the greenhouse and they are thriving. Also in this shot you can see the three raised beds Derek just built. These are 4′ X 6′ X 15″ beds. I am having a load of soil delivered soon and will be planting a fall/winter crop. Along the back wall, you can also see that we are creating a space to hang garden tools. Here I’ll hand it over to Derek to explain additional details of the project . . . When we had the site prepped for construction, we ask for a pit to be dug so we could set up a heat sink. A heat sink is a low-tech version of a heat pump. In a nutshell, the way it works is a small (e.g. 92-100 mm) 12VDC fan is placed inline with a pipe (still need to build the manifold for this – it’s currently sitting on my desk) that extends from the ridge down to the bottom of a 3x3x3′ insulated pit filled with pea gravel. The fan is designed to blow downward, sucking hot (or warm in the dead of winter) air from the top of the greenhouse and blowing it into the bottom of the pit. The warm air heats up the pea gravel during the day providing the heat sink. During the night, the fan continues to blow and the cooler air passes through the heated pea gravel and extracts the heat, blowing it into the greenhouse. At least that’s how it is supposed to work. We’ll see if theory matches practice. We chose an approximate 60-degree angle for the polycarbonate roof to provide an optimal sunlight angle (per the U of M article, it should be latitude + 10 degrees). We had to fudge a bit since we didn’t want a 3′ cripple wall, so the actual angle is closer to 57 degrees. Not a big deal as the greenhouse gets plenty warm right now (in fact, it is almost too warm when I’m in there assembling raised beds or shoveling gravel or filling the raised beds). Still on the to-do list: adding gutters on both eaves for rainwater management and collection, adding rigid foam insulation to the interior walls, filling the three 4×6′ raised beds with topsoil + compost, adding additional storage on the east wall (tools) and north wall (shelving), adding eave venting, heat-sink venting and electrical (solar panel + inverter + battery bank). Not a lot <cringe>. 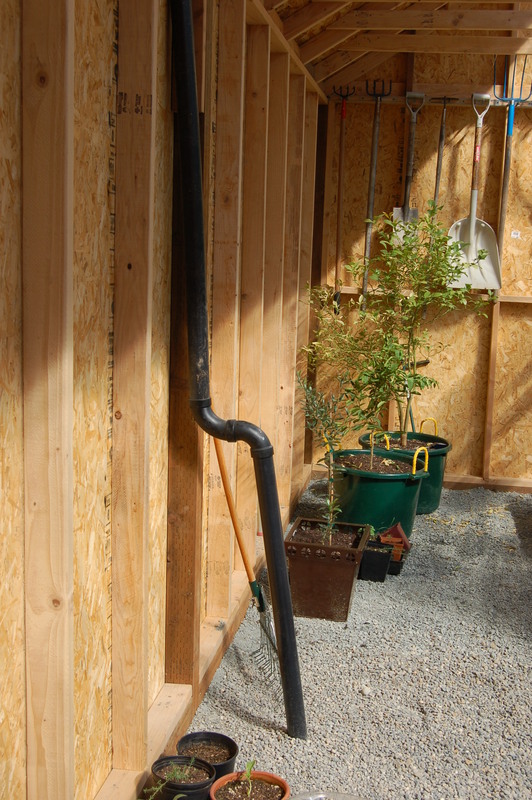 This entry was posted in Gardening and tagged greenhouse, heat sink, passive solar, polycarbonate. Bookmark the permalink. Sandy, thanks for the pics and info. That is absolutely awesome!! I’m jealous, I want one but have neither the space (1/4 acre lot) nor the capitol. 😦 Not to fear, I’ll have one some day! I love the heat sink idea too. I referenced that extensively, and it seems a fairly simple way to heat. Glad you like it! I’ve been wanting a greenhouse for a long time and am very excited that we were finally able to get one built. I’ll let you know how the heat sink works out (once we finish it and once the days turn colder). Hey Derek, is it possible to get a bit more detail on the heat sink construction? I’m not sure I get it. The insulation of the pit, how the fan is positioned to draw air from a cool spot to blow it through the gravel, etc. If there is a link someplace, that would work too. I’d hate to make you detail it out if it’s easier elsewhere. Thanks for a great informative blog! Our goal is to keep the greenhouse at over 50 degrees during the coldest day of the winter. With the polycarbonate panels, the greenhouse warms up nicely even on overcast days. Adding the R7.5 rigid foam insulation panels to the interior walls (pleasing pink for our daughter) should help quite a bit with that goal as well. I still need to suss out the solar panel & inverter that’ll be needed to power the fan (a surplus 80mm Nidec Beta V 12VDC @ 600mA ball-bearing fan), but it shouldn’t be too complex. If worse comes to worse, we’ll run an extension cord from the house and use a 1500W oil radiator space heater. Hopefully it won’t come to that, though. 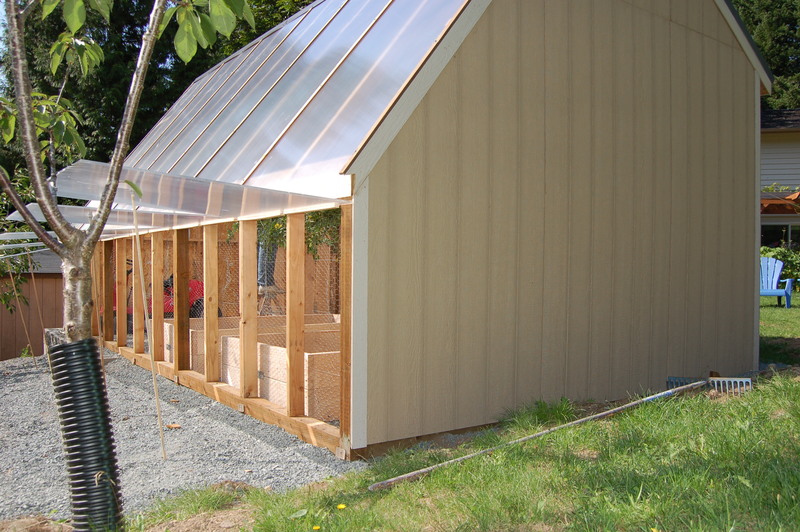 An attached lean-to greenhouse is our next major project. Anything you would do differently, having lived with your greenhouse for almost a year? A great example of a solar greenhouse, by a family that are committed to reducing there dependence on fossil fuels. SO did the heat sink work? I want to put one in our 8×12 greenhouse, but was wondering if 3x3x3 was big enough for that size? Hi there friends, its enormous piece of writing concerning tutoringand fully explained, keep it up all the time.